This page is devoted to folks that like to build things themselves. You can save a lot of money by constructing these items yourself. Send me information about your project ideas. 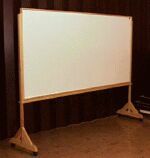 This money saving whiteboard is based around using an inexpensive white wall panel like those used in residential bathrooms. 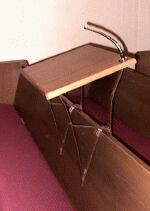 Great for setting up a stable platform for when you need to place a projector in the middle of a pew area. 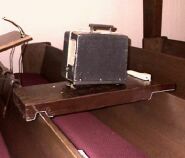 This often happens when you are in a church in which there is no center isle but the projector screen is center mounted and you need to project the image from the pew area. Includes a power cord storage area.